It seems that the Navigation Drawer is here to stay. I like the pattern besides some criticism, so I decided to implement it on a couple of apps I'm working on. What you can read here are just my thoughts about what I found interesting about it, hoping to help and learn from others. 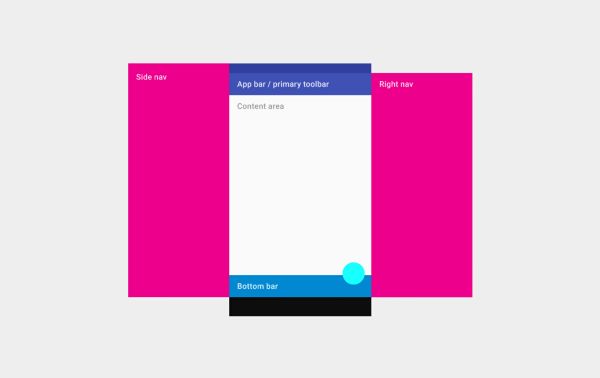 I’ve been studying the official Material Design specs for the Navigation Drawer, and I found out they are nice but a bit confusing, when it comes down to the actual width specs. So here’s what I found to be working nicely and pretty much matches Google’s best implementation, GMail for Android. 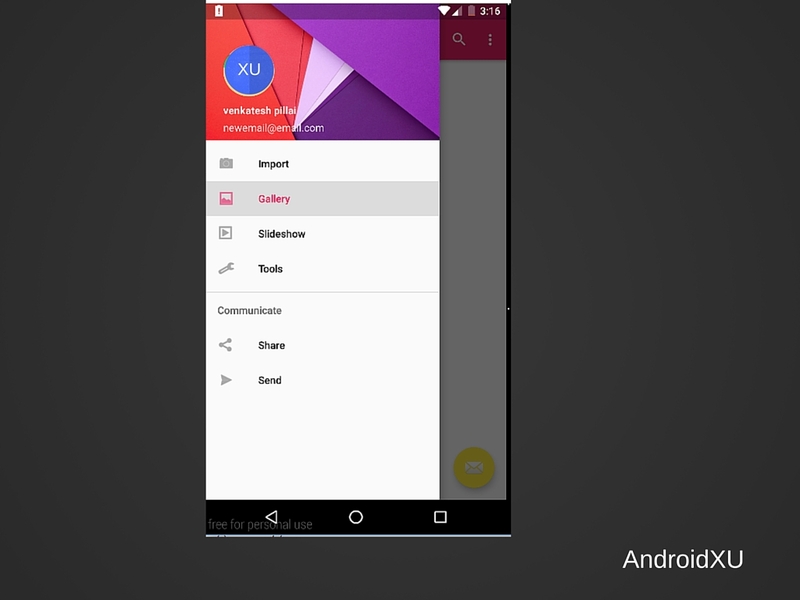 In the Google IO 2015, Google released the Android Support Design Library. It’s the recommended and easy way to add a Nav Drawer to your apps. Open the activity_main.xml where we will add the navview to it. This layout file will help to add the app_bar(toolbar ) . Create a nav_header_main.xml layout which include the first half of the navigation drawer with a profile image and name. The profile picture is rounded. There are different ways to get a rounded image, but I always remember this publication by Romain Guy talking about how to do it. So I decided to go with CircleImageView, it’s based on the Romain Guy techniques which can't be wrong. I haven't check the one used on the Google IO app but might worth to take a look at it. The image has a white border in Google Play Movies and Google Play Books. The other Google apps don’t have such a border. Google+ and Hangouts have the profile picture in the toolbar and it has the white border tho. The main activity class will help to toggle the open and closure of the navigation drawer. Once you run the app you can easily see the working of navigation drawer. 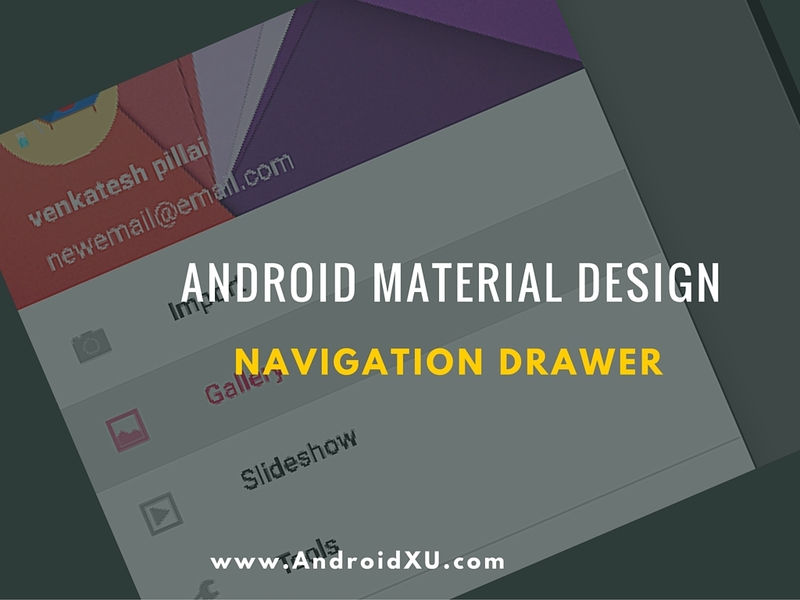 In this chapter on the Material Design Navigation Drawer is from my point of view the most important. A lot of misunderstandings about the history and purpose of the Navigation Drawer can lead to gross mistakes. Even if you have a perfectly sized and styled Nav Drawer, remember that the Nav Drawer is a tool and not an end. I must be missing something as I can't get the code to compile - things are missing. do you have a full working package?